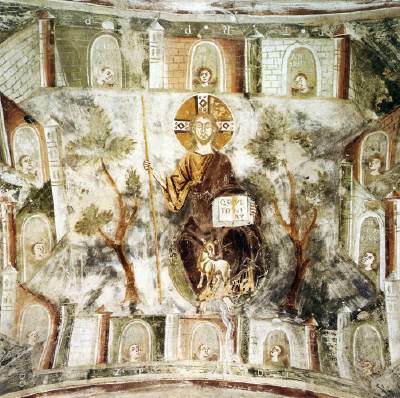 John’s description of the “Heavenly Jerusalem” is illustrated in a primitive yet straightforward manner in a fresco painted by an unknown artist on the eastern vault of the Church of San Pietro al Monte (Saint Peter in the Mountain), Civate, Italy. The artist, following John’s words (cited above) depicts the four walls that surround the New Jerusalem. There are three arched gates on each of the four walls; they represent the twelve tribes of Israel and each contains an angel. The names of the tribes are written within the arch of the gates but because of faded color and damage to the fresco, only a few of the names are discernable. In the center of the fresco, framed by the four walls is God, the focal point of attention. In accordance with his importance, God is depicted much larger in scale than anything else in the painting. He is sitting on a throne with a Lamb at his feet and a staff in his right hand. His left hand is holding an open book with the words “Qui sitit veniat” (Let him who thirsts come). Between God’s feet is the river of life flowing from the throne. It spreads out to become four rivers; thus indicating the Gospel is preached to every corner on earth. A tree of life is placed on either side of God. In Italy during the eleventh and twelfth century, the Byzantine influence remained a factor in art. Several centuries more would pass before changes brought on by the Renaissance would take place. San Pietro al Monte is on a mountain about an hour’s climb upward from Civate, Italy. It is not certain why it was built in such an isolated place or the exact date it was constructed. The following is one of the legends: Lombardy King Desiderius built San Pietro as a result of a dream in which he was told if a church were to be built there, his son’s sight would be restored. After it was built, the king asked the pope for relics for the church. He was given the right arm of Peter and links from the chain that bound him.